Every year I like to plant trees and 2017 is no different. 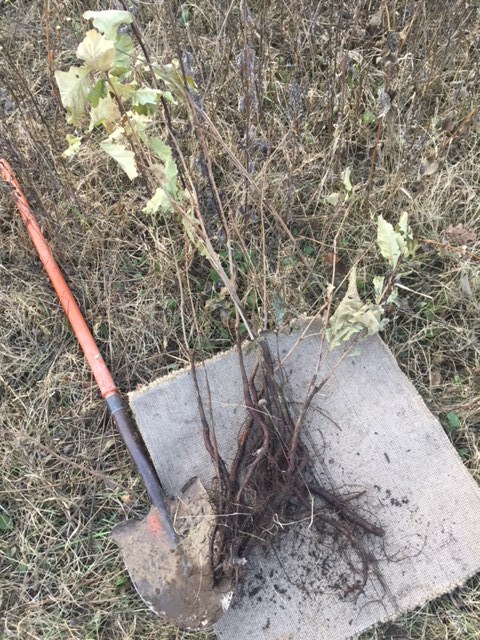 Last May I planted 200 nursery trees as well as untold numbers of willow cuttings along the trout stream. 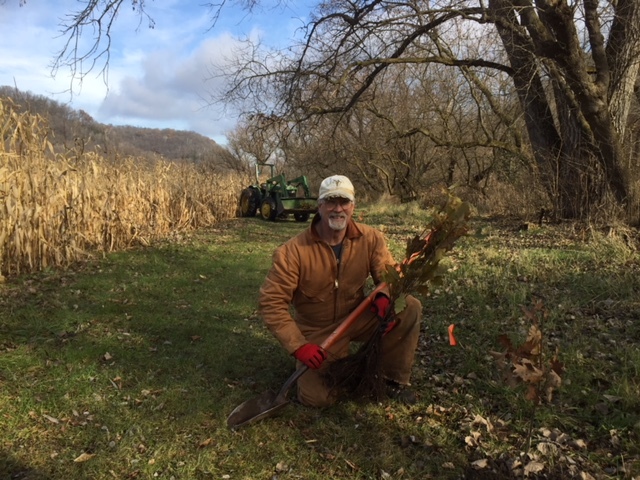 In the last few days I planted 200 more from the Iowa DNR nursery: 75 red oak, 75 swamp white oak, 25 black cherry, and 25 hackberry. It’s an ongoing project to bring up the quality of habitat here on the Chisholm Valley farm and also on the Oak Ridge farm. There is a tremendous amount of satisfaction in watching theses trees grow, especially over time. When I walk quietly along the paths or along the stream my heart soars as the trees grow. I’ll never see some of them mature, but it’s neat to see anyway. The trees come from the Iowa DNR nursery. They cost 90 cents and are 20 to 30 inches tall and healthy. The phone number for the IDNR nursery is 515-233-1161. Call for a catalog; they are very helpful. Also, we have our annual Christmas Open House this weekend on Saturday, December 2, and Sunday, December 3, from noon to 6 p.m. I would be happy to talk to you about tree planting at that time if you are interested. Let me leave you with three sayings that those of us who plant trees appreciate. Enough for now. Hope to see you this weekend at Chisholm Valley Wildlife Art! I just got back home from bow hunting in Kansas. 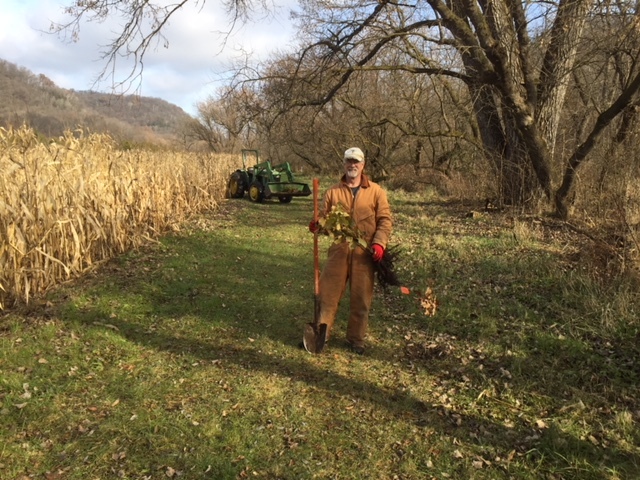 I like to hunt in either Kansas or Iowa during the Minnesota firearms season, usually after the first weekend when I hunt near home with the kids. This year on the first weekend in Minnesota I hunted with Hannah and also with Dave Ramirez, Heather’s boyfriend. On the first morning, Dave, who had never hunted deer before, had a shot at a nice buck, but missed. That evening Dave got his first deer, and Hannah got one also. Dave got another the next day. All three were antlerless. That’s three in the freezer, plus the better part of one left over from last year, so we are in good shape in the venison department. Still, I’ll take a couple more with the muzzleloader later this fall. With the kids increasingly embracing the healthy local source of meat that we have on the land, five or six deer are what we need. So here is the summary of my Kansas deer hunt this year; in a word, it was frustrating. I stay and hunt on Bill Brannan’s property in NE Kansas. Bill is a good friend and a dedicated conservationist, and his land, though not big, has a long history of big bucks. Lots of them. Over the years I’ve seen them; I’ve seen their sheds, their trailcam photos, the big ones that Bill and his family and neighbors have taken, and the ones that are found dead occasionally. But not this year. 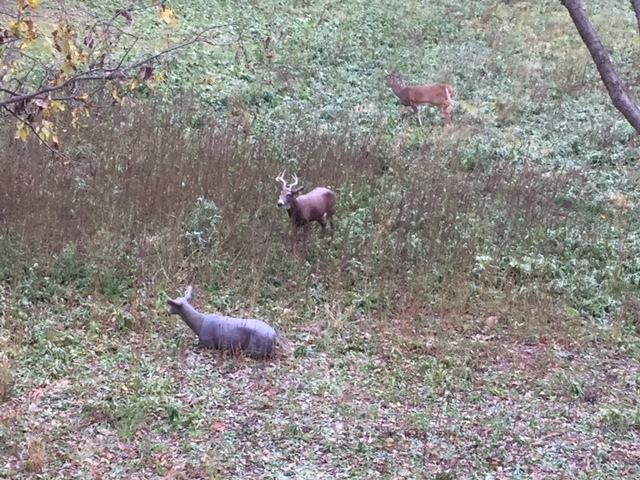 This year I passed many small bucks, one- and two-year-olds, and a couple small threes. But I never did see any of the big mature bucks that Kansas is known for. Bill thinks that his older bucks are being poached–shot off the road but usually not recovered by outlaw “hunters” who fear being caught if they track a wounded deer. This area, because of its deer quality, has long suffered the poaching scourge, so Bill could very well be right. I tend to think it’s more likely EHD. They had a very serious outbreak in 2012 that greatly reduced deer numbers, and this summer was very dry again, but nobody really knows. I am posting a photo of the dead deer that were found on this property this year, mostly late last winter/early spring. Six nice bucks off 240 acres; it’s no wonder I’m not seeing any this fall. Still, hunting here in Kansas is always a good time. The cabin where I stay overlooks a really nice small lake. Turkeys, bob white quail, waterfowl and lots of other kinds of wildlife are common, and even an occasional bobcat. Great flocks of snow geese call from the sky, some are high, others are quite low. Always fun to watch. But where are the older bucks…it’s frustrating. Almost like Minnesota! 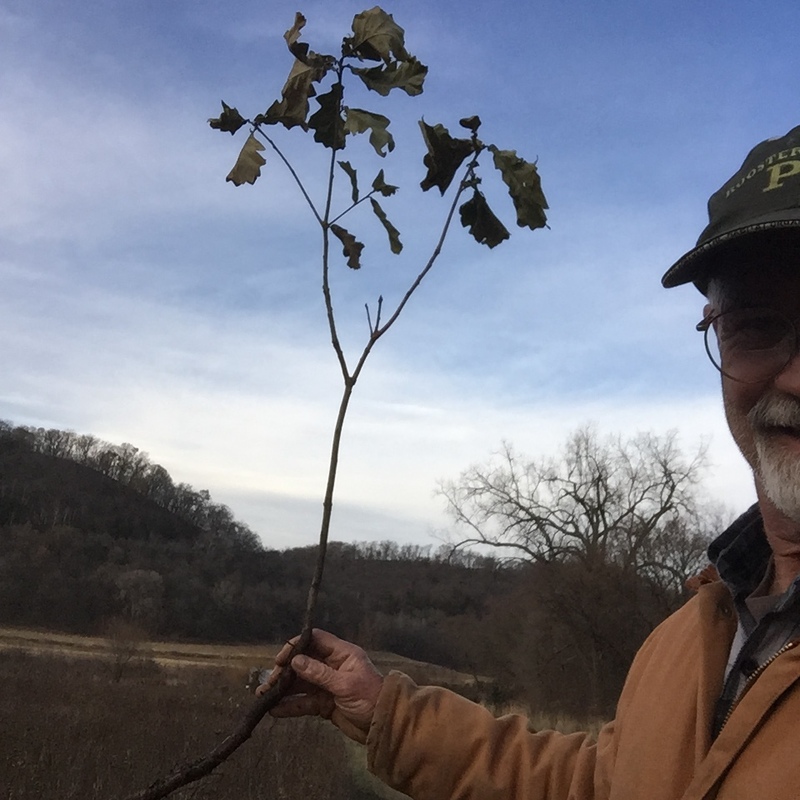 I got my truck back this afternoon and headed out to Augie Williams’ to hunt the “2nd woods.” This has been my favorite place for many years and is where I hunted a couple evenings ago before my truck broke down. This place always has big buck potential, and it is from here that I put two fine bucks on the wall over the years. Unfortunately, when I got there my favorite hunting corner was already taken. As I mentioned earlier, the GSC is now public and there were several hunters who knew where I hunted and had been crowding me out for the last week. With my truck out of commission for a couple days I wasn’t there to defend my place and they took swift advantage of that. It was no doubt going to happen anyway, but I was surprised that it happened so fast. We’ve all been there and I’ll find another favorite for next year, but I guarantee that I won’t tell the bow hunters at the GSC where the heck it is! This morning I set up my decoy again, and used my rattling horns, thinking that the time was right for this to work. I brought in a yearling but nothing more. On the way home, I had a bearing go out on my truck and so I took it into the repair shop in Houston to fix on Tuesday afternoon; it will be Wednesday afternoon before it gets fixed. I hunted from home until I got it back, with nothing interesting happening. When I hunt Augie Williams I only hunt one small group of trees that borders the Girl Scout Camp. It’s only about 5 acres but deer pass through it a lot. Since it is so small I hunt it very carefully, the stands are put up months or years ago, the entry and exit paths are carefully followed, and I let it rest at least a day between hunts. Two or three days’ rest is even better. Because the GSC became public this year it was very difficult to hunt it as carefully as I have in the past. But it’s still my favorite hunting spot so I went there this evening. I saw about ten deer on that hunt, three were bucks, all too young to shoot. One chased a doe close under my tree, with her two fawns following and probably wondering what was going on. There is no doubt, the rut is on. So far this year the deer hunting has been poor, for bucks anyway. This is not surprising, typically Halloween is the first day that I consistently see daytime rut activity. Before that day almost all the lead up to the rut takes place at night, and almost none of the does are interested anyway. But everything changes on Halloween. The 30th of October was a day before Halloween, but close enough for me to get excited. 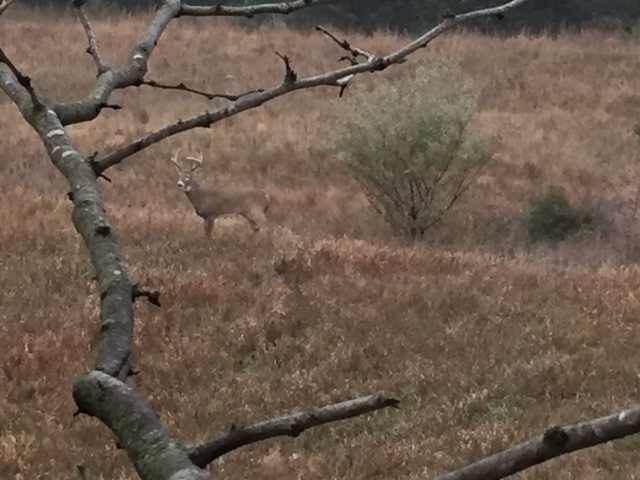 On that morning I put out a buck and a doe decoy on the east end of a long CRP field. The wind was howling from the west, coming down the length of the field and delivering bursts of rain, then sleet, then snow. It didn’t take long for me to be cold. After an hour or so the decoy blew over; considering the wind I was surprised that it lasted that long. Actually, I was surprised that I had lasted that long in a tree stand as well. So I unbuckled my safety belt and started to climb down to fix it. When I was about halfway down the tree, from out of the woods in back of me a doe charged past and headed out across the open field. Close behind her were three bucks, all trying hard to keep up and grunting like a bunch of hogs as they passed by. I never heard a thing until they almost ran me over. One stopped to stare at the decoys for a few moments then turned to catch up with the party, and by then the others were almost out of sight. So I got the decoy set up again and got back up onto my stand with a new sense of optimism. I was still cold but now optimistic as well. After about a half hour more the doe raced crossways across the open field again, only this time instead of three bucks chasing her, now there were five. 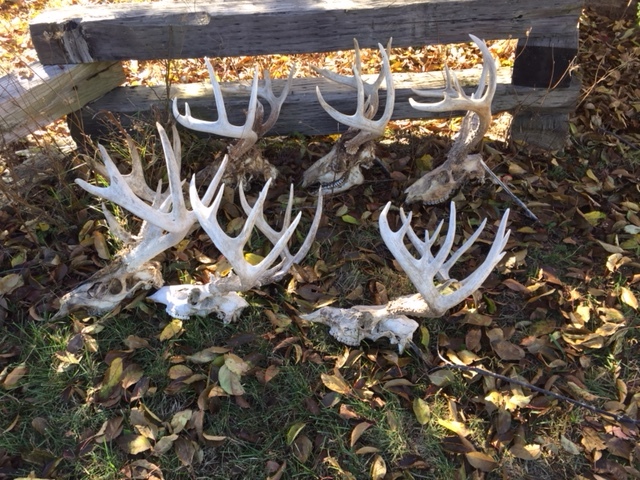 Four of them were one, two, or three year olds, but the fifth was much bigger, clearly the kind of buck that I was looking for. They all chased around in circles for a while and then she stopped and laid down. Meanwhile I’m starting to wonder what this old gal might be willing to do for five bucks! I know it’s an old joke, but hey, what better time to use it. Besides I can’t help myself anyway. Back to the story. After stalling for a little while buck number six showed up. This one is much bigger than any of the others and I don’t have to look him over twice to know that I would try for him if I had a chance. He is a high, wide and very white racked 8 or 9 pointer, with the heavy neck and body of a fully mature buck. So then the doe gets up and leads the chase again, around in a few circles but staying in sight in the field this time. Then she stopped and stood to let the new big boy mount her. All five of the others just stood there, less than twenty yards away with no attempt to challenge or interfere with what was going on. It was interesting also in that he stayed mounted for a long time, perhaps a minute or so, not the few seconds or so that is usual. Was he staying to intimidate or torture the overeager onlookers, or was he just enjoying the moment? Clearly, I’m starting to overthink this stuff. But to appreciate this you have to know how rare it is to see wild deer breeding. Many hunters never see it, and with all my time in the woods I’ve only seen it a few times. Anyway, after he dismounted she took off again, this time angling towards me with the whole bunch of bucks once again in hot pursuit. As they raced by, still out of range, two of them peeled off to check out my decoys. One was a yearling that kept his distance. The other got close, about ten yards away and right between the decoy and me. Then he got nervous and circled downwind and presented an easy 15 yard shot. I passed. He is almost certainly a two or three year old with a fairly heavy, dark 8 point rack with short tines. I hope he makes it a few more years. 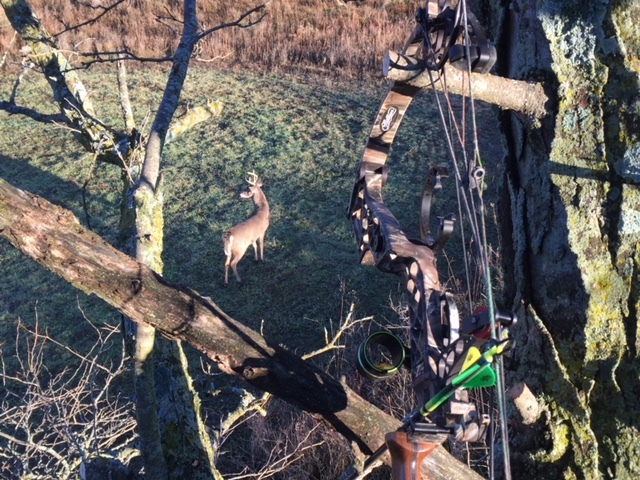 The rest of the morning was uneventful, but Chris Knutson was hunting a few hundred yards away and thinks the big buck and doe went sneaking by him a bit later. I think he’s right, they went his way when they left me and the buck he saw had a big white rack.